360 controller (default plugin) randomly does not register input. I have the plugin setup and have my controller connected. However as I'm playing Jak and Daxter the precursor legacy my inputs will randomly not be recognized. I will sit and tap A 4-5x in a row with nothing and then randomly get a jump. It's not lag as the game is running full speed. Is this a common issue? I'm using the latest dev build should I return to the "stable" version? (03-06-2015, 03:09 AM)Bigbenn01 Wrote: Is it wireless? Wired directly to USB. It works fine for other PC games like Valkyrie Chronicles. Can you take a screen shot of the pad plugin page? Uncheck DirectInput, it may be interfering. You may need to configure the controller again too. Nope, in fact my joystick inputs are messing up now. It only half registers some directions and not others. I tried rebinding and adjusting the deadzone but it didn't help. Can you go into the control panel, Devices and Printers page. 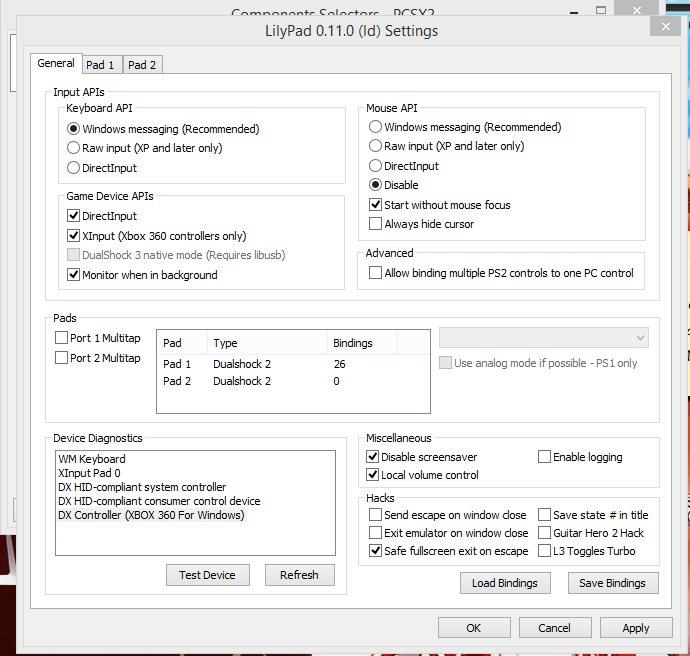 Find your controller, right click on it game control settings, and hit properties. Make sure the controller responds fine there. If it does, turn off XInput, and leave DirectInput enabled instead. Settings are for Windows 7, don't know about 8. Try using DirectInput, if that doesn't solve it, you might have to find an older version of Lilypad. I don't believe it's been updated for a while now, so 1.2.1 and the github versions should be the same. Current time: 04-19-2019, 03:19 PM Powered By MyBB, © 2002-2019 MyBB Group.